Say goodbye to MarioWiki Story. It's cancelled. File:Controller example minus.png This user hardly plays Video Games. File:Box open.png This user edits his own userboxes. This user is friends with DB. This user thinks Yoshi is cute. This User is friends with TB101 and is also a part of Toadbert101's comics! 8.2 Say hello to my .Gifz! Hi there! My name is ~Lil ' Boo Ciao! . Nice to meet you. I joined 1st of August 2007. As you can see I don't edit much due to lots of homework. So I don't have enough time to contribute the wiki. The reason why I came here was to meet new people. There all very nice! Except some.... Anyway I'm a 17 year old Christian. Don't worry young ones! I'm friendly with children! I used to be a user on Pokemon Crater. There was some guy called "lilguy" on the chat and he was bragging and spamming about MarioWiki. He (obviously) got kicked. So then I wanted to go on MarioWiki. I wen't to message him on his account asking what's the name of the website. 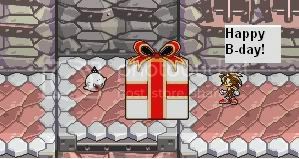 He replied "www.mariowiki.com". So then I went there and I went on the chatroom. I don't remember who I first met there thought.... I think it was, Uniju, Xzelion , Toadbert101? Maybe it was them. When I first went on the chat my chatroom name was UnbornPixel. I then thought it was lame and I changed it to Lil'Booster (see below). I made and account and then joined the wiki. And then I met him. Well I was gonna be called UnbornPixel but then I thought the name was stupid and I didn't like Super Paper Mario anymore. So then I thought of a game I DID like which was Super Mario RPG. I thought Booster was funny so I was gonna be called Booster but someone had that name. So then since my sprites were quite small (I decided my sprites could be a Boo) I added "Lil'" Infront of my name. 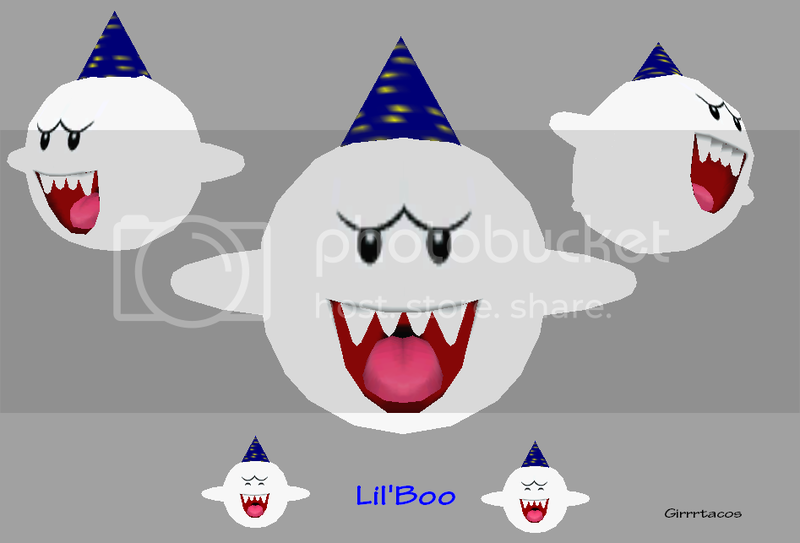 Then I changed it to Lil'Boo cause I (and 2 other people) said it was a better name for me to have. This is a video me and my brother made. Yes it's of SMWA. Here are some comics I like. My Comic. Most episodes are about everyday stuff but in the newer comics there more about adventures. Pretty good overall, but it needs Improvement. Uniju's comic. Its about this Realm 0.5 and how Xzelion goes through it and stuff. Nice. Pretty confusing, which is good, but nice. And it reminds me of Anime stuff. DP's comic. It's about how a Magikoopa called Malcuro and he is the leader of the Dark Team. The Dark Team take over various lands of the MarioWiki thus turn some users evil. Whilst some are still un-infected. Xzelion travels with a gang and DP to stop the Dark Teams plans of collecting all the Fantasy Gems and also taking over the whole MarioWiki. Awesome! I love it. One of the Best comics featuring Mario Wiki. Toadbert's comic. It's about how Ax turns evil and... GAH you find out! Anyway, It's good! Pretty funny i'll tell ya that! To make my comic be a rival with TSC, TLA, WSA and other awesome comics. My real name is Maxamillion. I'm black in real life. No racism please. My "Character" is 10. You may not understand this. I think yoshi's are cute. I think Boo's are cute and pwn. And ~PY agrees with me. I think Steve should get $10000000000 for being the maker(or the founder. I dont really know.) of MWiki. I have 13 year old sibling and his name is TehBooKid. If you want to meet him respect him. I don't have a dad :(. Really! I don't! Note: I have quit gaming. "Don't Watch me watch TV!" "Hey Snack! can I have a Snack? I'd love a snack. Say hello to my .Gifz! you may add this to your user page. Ask before using please. Please note that you do not have to give me credit but If you'd like to then please do so. My new house which took me forever. Again ask before use. Use either one. I don't really care. Well since it was my B-day on November 15th. I got some stuff from these guys. Credit to them!